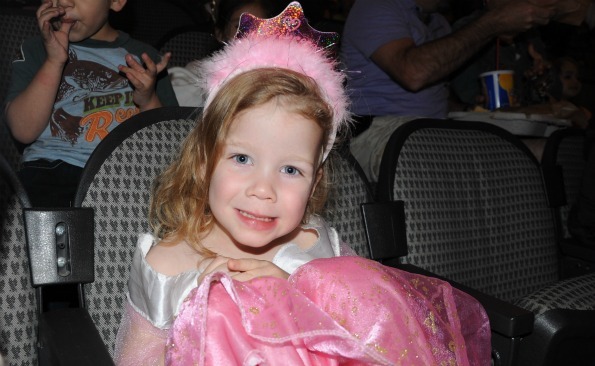 We took a magical trip to the world of fairy tales last night with Disney on Ice’s Dare to Dream. While the show has all of the wonder and beauty that Disney on Ice is known for, I think Dare to Dream really might be their best show ever! My family attended the opening night performance in Dallas. Mickey, Minnie, and friends came out first and then began to tell the audience the stories of three of the Disney royal princesses – Tiana from “Princess and the Frog”, Cinderella, and Rapunzel from “Tangled”. The cast of world-class skaters were incredible and they brought the romance, humor and adventure of these classic stories to life. 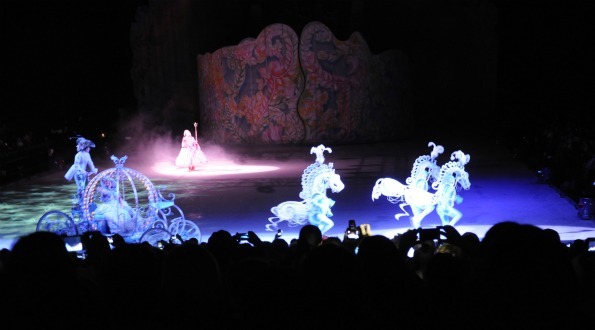 She Is Dallas Info: Disney on Ice Dare to Dream will be in Dallas for the remaining dates: Thursday, March 29 10:30am and 7:30pm, Friday, March 30 7:30pm, Saturday, March 31 11:30am, 3:30pm and 7:30pm (SPANISH Performance), and Sunday, April 1 1:30pm and 5:30pm. The performances take place at the American Airlines Center located at 2500 Victory Avenue, Dallas, TX 75219. Tickets are available at the Ticket Master website or by phone at 1-800-745-3000 as well as at the arena’s box office. Tickets are $75 (Rinkside), $45 (VIP), $30 and $15. All seats are reserved. 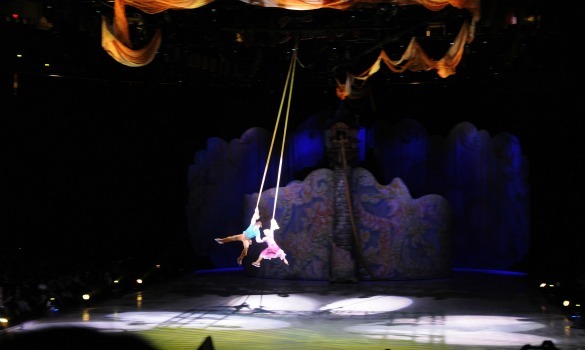 To discover more about Disney On Ice and to see some fun video highlights from the show, go to the Disney on Ice website. 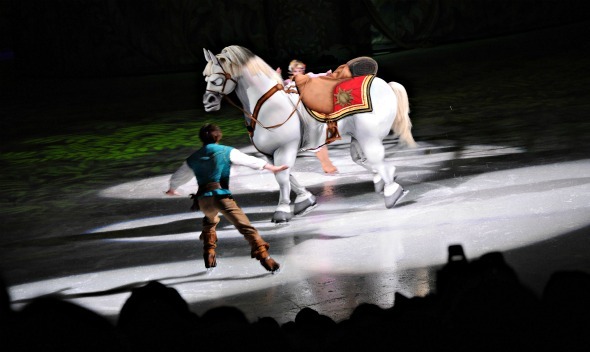 You can also visit Disney on Ice on Facebook and on YouTube. Of course, there were lots of little princesses running around. My little girl dressed for the occasion in her full princess attire complete with a smile from ear to ear. I was completely entranced by Dare to Dream. I can’t help but wonder how many times my husband noticed the big goofy smile on my face as I dreamily watched the characters live our their dreams and find the love of their lives. *swoon* I think I may have enjoyed the show even more than my little girl! Dare to Dream may appeal mostly to girls because of all of the princesses, but boys will have a great time at the show as well. My 7 year old boy didn’t want to go with us at first because he said it was “too girly” so I bribed him by letting him bring a pack of glow sticks to play with at the show. But he actually forgot about the glow sticks for much of the show because he was dazzeled by all the lights and music and action taking place in front of him. There were plenty of evil stepmothers, bad guys, and animals running around that my boy had a great time. His favorite characters were from Tangled – Flynn and the horse Maximus. We all sat in amazement at some of the impressive skating but there was actually flying and acrobatics used in the performance as well. This was probably my favorite part of the show. 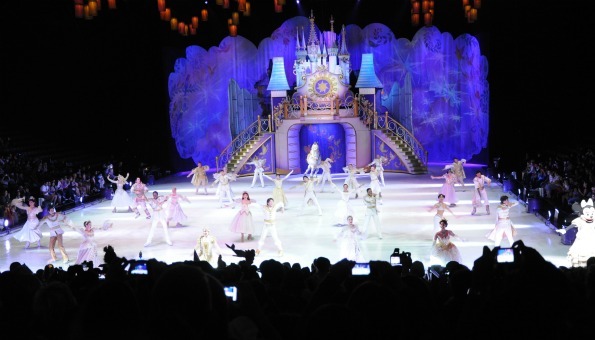 Disney on Ice’s Dare to Dream is a wonderful celebration of Disney and the passion of dreams. 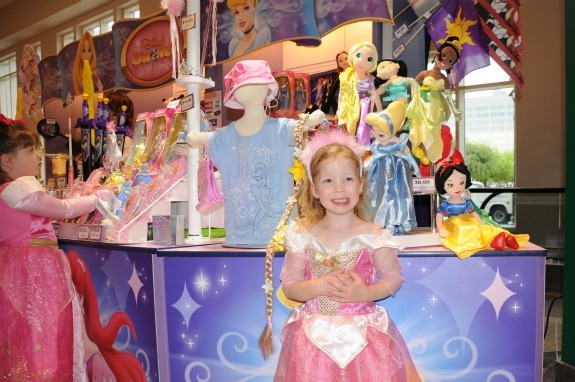 It is truly fun for the whole family but especially if you have a little princess in the family! There are only a few performances scheduled for Dallas so get your tickets now. You really don’t want to miss this! Previous Post: « Is March 30th Your Birthday? Get into LEGOLAND Free Friday! Great review and pics! We loved the show as well!!! It was so fun, we loved it too, especially Tangled!……great pics!! !